Spheres are the universal shape for balls, amigurumi, stuffed animal parts and plenty of other things that you may want to crochet. There are many ways that you can crochet a sphere; here is a tutorial for one of them. You are going to start off by crocheting a circle, then you are going to make the middle of the sphere and decrease it to finish. Below is a pattern for a very small sphere. You can increase it by following the notes to increase the initial circle and increase the number of rounds made for the middle. Note: to increase the size of the sphere, continue to increase this circle. Note: rounds 6 – 9 make the body of the sphere. In general, the number of rounds to make the body should be the number of rounds completed thus far minus one. For example, there are five rounds before round 6 in this pattern. Therefore, there are four repetitions of the above line. The amount of repetitions for a different sized sphere also depends on a crocheter’s style. Some crochet tighter than others. Note: if you increased the size of the sphere you will also need to decrease the sphere as much as you increased it by. 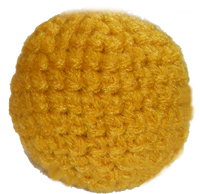 If you need help crocheting this sphere, just leave a comment and I would be glad to help! This entry was posted on Friday, April 17th, 2009 at 12:00 AM by Rachel Choi	and is filed under Free Crochet Patterns, Tutorials and Help. You can follow any responses to this entry through the RSS 2.0 feed. You can leave a response, or trackback from your own site. Thank you for posting this! A great way to use up leftover yarn to make cat toys, dog toys, etc. Yay-the perfect cat toy and a great way to practice my skills, thanks! I’ll be linking. I was wondering on this How to Crochet a Sphere pattern/tutorial, are there supposed to be two Round 10’s or was that just a typo? Thank you! Love your website! I always wanted to know how to crochet a sphere. Thank you for your tutorial – I love it! For the sphere the decreases are done across 2 stitches, so that there is one less stitch after each decrease you make. The traditional way of doing a decrease is to insert your hook into the first stitch, pull up a loop, insert your hook into the second stitch, pull up a loop, then yarn over and pull the yarn through all 3 loops on your hook. After you do that you’re done and you can count it as one single crochet. Anyway, I did have a question. Probably a n00bish question, but this is my first time making spheres. When I increase the rounds, do I continue to make more rounds of 2 sc in one stitch then 3 sc, or do I increase the number of sc after the 2 in one stitch? I’ve made my first sphere, and am going to stuff it this afternoon, but it was extremely difficult to figure out the counts after the 5th round, and I think I messed them up somewhere as my hole is almost closed and I haven’t started the 2 sc section, yet. Yes, you increase the number of sc after the 2 in one stitch if you want to make your sphere bigger than the finished size indicated in the pattern. Also note for rounds 1 – 5, you should end up with a flat circle when you are done these rounds. Common mistakes are miscounting stitches so using a marker to mark the end/beginning of a round will really help. Thanks again for the site. I’ve been looking at some of the other patterns you have on here, and I will definitely have to give some of them a try after I finish this project. Moogles turned out great. Thanks for the help. Now I’ve run into another dilemma with my newest project. I’m working on a new doll pattern, and the way I’ve been doing the bodies for my dolls is basically just extending out the center portion of the sphere. This particular pattern, I am going for more of a conical shape, so I am doing several rounds then reducing. Shape wise it looks great, but this particular pattern requires regular color changes through the sphere. The front half of the body is white and the back half is black. Now the problem that I’ve run into (Aside from needing to adjust the pattern as a whole, but that was to be expected) is that when I stuffed the doll, the stitches didn’t line up down the center. I examined some of my other pieces and realized that the stitches aren’t even down the length of sphere. Do you happen to know how many rounds I should do before moving the color change one stitch? I’m not exactly sure what you mean by moving the color change one stitch, but I would recommend using stitch markers to mark the places where you need to change the colors, such as at the beginning of each round or half way, etc. Yeah. I have the first stitch of every round marked when I start the round. Problem I’ve run into is that changing from black to white at the beginning of the round, then from white to black halfway through the round, makes the line of the color change twist around the piece. I’ve experimented with it a little bit, by leaving my marker in a round and stitching 4 rounds from there (counting very carefully), and it marker is off center from where I finish the round. Is there supposed to be a ch1 between each round? Does a decrease imply 1 sc for the sc count in the end of each round instruction? For rounds 6-9, are the sc counts for each round the same? I’m new to crocheting in rounds. The sphere turned out great even though I wasn’t sure of the answers to these questions. There isn’t a chain 1 between each round. This is crocheted in a spiral fashion so that there are no creases. And yes, for rounds 6 – 9 the stitch count is the same. Each of those rounds have 30 sc. I don’t get it. I was on round 5 and going around and when i finished the round, the hole got to be about 1 cm in diameter. Can you try to tell me what I did wrong? Hi Dasia, sounds like you aren’t increasing. When you get to round 5 you should have a flat circle. Be sure you count the stitches on each round and are reading the pattern correctly. The number at the end of each round tells you the total number of stitches made on each round. Rachel, thank you for all your patterns. You have a fresh way of looking at ordinary, necessary crochet items and make them pretty and fun! I have been looking at a lot of instructions for making spheres, but they are all made with worsted weight yarn, so they have 20-26 rows. I need instructions for a ball that has 30-40 total rows because I am using cotton crochet thread and a size C crochet hook (very small). The 26 row instructions I found made a very small (2″) ball. I am looking for a 3″- 4″ ball. Hi Charlotte, you can use the instructions in this pattern to adjust the size of your sphere as you see fit. If you get stuck, just let me know which part and I’ll help you out. Hi Rachel. 🙂 I’m a fibers student, and I’m trying to make some pokeballs. I know how to chain, but I’m not sure how to chain two, and I see it in every sphere pattern I’ve looked for. Could you possibly explain it to me? In the tutorial you will do steps 1 – 3, to complete 1 chain, then repeat steps 2 – 3 to make your second chain. I’m trying to do the 6 ss into the second chain from hook. I can do the first ss. When I go to do the second it just pulls the yarn out from the 2nd stitch from hook so I end up making a chain. What am I doing wrong? Hi Julia, I don’t think I understand what you mean by “it just pulls the yarn out from the 2nd stitch from hook”. If you don’t mind elaborating a bit more, maybe I can help you better. I’m having a hard time trying to visualize what you’re doing. After you make your first sc into the second ch from your hook, you’re going to insert your hook again into the same chain and make another single crochet just like you made the first. After you make all 6 sc into the second ch from hook, it’ll create a very small circle. Sorry I meant sc not ss! Hi Rachel. It’s difficult to explain but I think I am missing part of the sc process. I make the first sc by pushing the hook through the 2nd chain and pull the yarn through the loop on my hook, then when I put the hook through that 2nd chain again to make the second sc I bring the yarn back out to pull through the loops but the yarn pulls back out and it isn’t attached in any way to the 2nd chain so I make a new chain. So instead of the 6sc in the 2nd chain I get a new chain of 6 stitches 🙁 Not quite right somewhere!!! When you make your first sc, you’re going to insert your hook into the 2nd chain from your hook (now it should look like there are 2 loops on your hook). Then yarn over (wrap the yarn around your hook) and pull the yarn through one loop on your hook (2 loops on hook when you’re done this part). Then you’re going to yarn over again and pull the yarn through both loops on hook (now only 1 loop on hook). This is the whole process for the single crochet. Feel free to take a look at the tutorial I linked to to see a picture tutorial. Aha! I was doing it wrong. I thought that process was double crochet. I’m just learning so thank you so much Rachel 🙂 Now I can make my friend’s kitten a little ball to play with! Yay! I’m glad you got it now 🙂 Let me know if you end up needing more help. Ok this looks really helpfful but I’m COMPLETELY new to crocheting so ummmm…. whats with all the sc in hfajkafdhbg stuff?? Let me know if you end up needing more help. Hi Ally, since you’re making a sphere it’ll always start with round 1 with 6 sc. You’ll continue to increase each round by 6 sc until the width of the circle you’re make is twice the size of the initial cherry’s width. Then you can count how many rounds it took you to get to twice the width (will most likely be 2 times the number of rows you made for the initial cherry), and then calculate the number of rounds for the body you will need (in general, the number of rounds to make the body should be the number of rounds completed thus far minus one). Then you can decrease to close the cherry, subtracting 6 stitches each round. You can use the same hook. What do the abbreviations stand for? Like ‘sc’ and ‘ch?’ They are probably the most obvious answers EVER, but I am not sure. I’m not quite grasping the first decrease for row 10. No matter what I do my row doesn’t come out to 24 …? It’s like the opposite of the last increase row that you made. Let me know if you need more help with it, and I’ll be sure to explain it in more detail if needed. I’ve got a question. I’m making a large ball 7″, I’ve increased for 20 rows which equals 7″. I’m a little confused by the Note for rounds 6-9. Does this mean that I will create the body by working 19 rows? Hi Starr! Yes you would do 19 rows. But you can always adjust if you think its too much or too little. I’m new to this sphere thing. I tried to make this pattern but then I got confused. My question is: on the first round we make 6 sc, so on the second round we make 6 more sc or just 12 sc? Yes, you will make 6 more single crochets, for a total of 12 single crochets on round 2. Each round that increases will have 6 more single crochets. The number after the colon at the end of the round is the stitch count for the round, so you can double check your work to make sure you made the correct number of stitches. Might be a dumb question, but after decreasing to 6sc if I want to just finish off the sphere should I keep decreasing? There’s still a large gap, but I’m afraid decreasing more will compromise the shape of the sphere and somehow make it pointed. If I had an opportunity I would just use “trail and error” but since I cant right now, I thought I would ask first. You can finish off and weave the hole shut with the end of the yarn. You can try to crochet tighter with a smaller crochet hook or not stuff as tightly.